Cupcake close up, originally uploaded by Roxy_l. 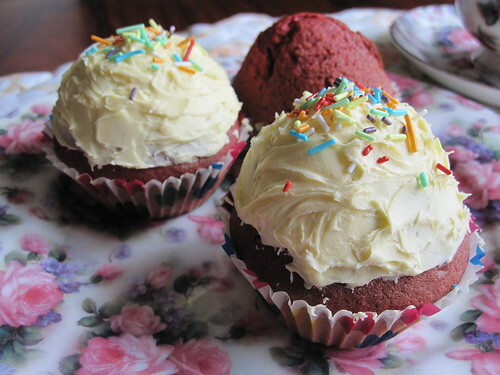 I got the urge for baking something to go with some buttercream icing, cupcakes of course! I wanted something easy, but I also wanted Red Velvet. All the recipes I found though seemed a bit long winded and I don't know if I can find buttermilk in the UK. I've never seen it, and I'm not sure what it is really. (Update: I know what it is now, supermarkets do sell it. I've also made it from scratch, it's a by product of butter. Yes I tried and made butter). So I decided I'll make it up as I go along and hope for the best. After all I should still get to eat cake. 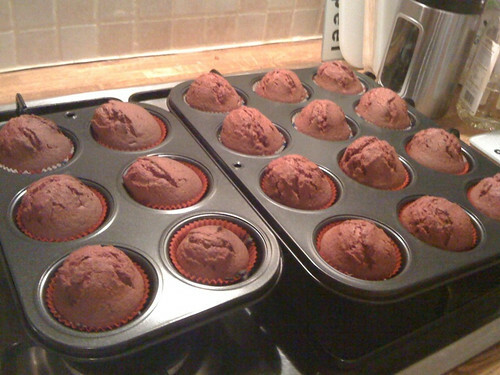 My cupcakes did end up looking more like muffins (I'd used self raising flour and filled the paper cases 3/4 up), but it did mean I didn't have to put that much icing and still got mound look that I like. The next time I make this I'm going to make a few more changes and see if I can make it better, but I'll add what I did anyway. I'm no baker, but the cakes tasted good. Melt the butter in a pan. In a large bowl add the sugar and eggs, then beat until completely mixed. Then add in the butter and mix until there are no lumps. Slowly add the sifted flour to the mix, and beat until it is a smooth mixture and has a little air in it. Add the cocoa and food colour, mix well. Then split the mixture into paper cases placed in a muffin tray (I made 18 cakes, but if you don't want them to rise as much as mine then divide into more cases). Bake for around 10-20 mins, push a knife into one of the cakes to see if it's ready and if it comes out clean it's done. I placed mine in an oven set at Gas mark 5 / 190 ˚C (or 375 ˚F). 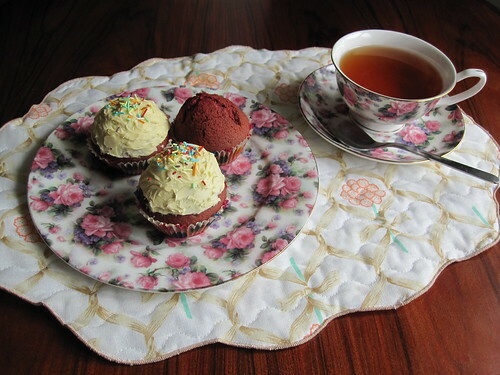 I cheated with the icing and bought the ready made stuff, then covered the cupcakes when the were completely cool. Today I'm wearing a top my mum made me from a mens work shirt, she kept the buttons down the middle but it's not manly still. So I'm happy wearing it today, so I'm technically wearing a work shirt with pinstripes and all. Haha.